Tropea is a seaside resort with impressive scenery in the region of Calabria, in the south of Italy. This stretch of coastline on the Tyrrhenian Sea is called the Costa degli Dei, the 'Coast of the Gods', and it is hugely admired by those in the know as one of Italy's finest summer holiday destinations. The coastline curves outwards in a large hilly bulge, boasting dramatic cliffs, sunny beaches, and a string of little resorts and campsites. Tropea is the busiest and most attractive of these seaside towns; with a historic centre perched on cliffs above the sea. Tropea is large enough and interesting enough to serve as a base for a longer holiday, and the local railway line and boat trips allow a certain amount of exploration without the need to drive. Although it is not particularly well-known to English-speaking travellers, Tropea is popular with Italians and with sun-seeking Germans, many of whom drive south in camper vans or head for the area's campsites. Italians mostly holiday in July and August; in May, June and September Tropea is both cheaper and less crowded while the weather should still be warm and sunny. Tropea's principal social activity is a traditional one with a twist. Any time of the day or evening you'll see holidaymakers and locals taking a passeggiata down Corso Vittorio Emanuele, strolling along and people-watching, before reaching the the street's sudden end, where a set of metal railings offer a dramatic view over the beach and sea. The next stage in the ritual is to lean out, admire the view, chat a little, then wander back up the road to sit with a drink or to perform another circuit. Tropea has that lovely timeless, faded feel that is a characteristic of sleepy southern Italian seaside towns. There aren't many specific tourist attractions, but the town is a maze of pretty lanes and palazzi - some of which are crumbling away - and little hidden squares where you'll usually find restaurant tables. The heart of town is up on the headland and if you explore the streets you'll find traces of the old town wall and fortifications which defended the landward side. Nowadays the town spreads out further, and after you've wandered among the lanes and enjoyed refreshments in the shade of a cafe parasol, you will want to descend to the sea, both to enjoy the beach and to obtain the best views of Tropea's citadel on its rock. For some insight into Tropea's history, and suggested itineraries for your rambles, you can buy a guidebook from a number of shops on the main street. There is a tourist information office in the central square, Piazza Ercole, and there are a few agencies which book boat trips and excursions and can provide further advice to tourists. The most famous views of Tropea are of the large rock outcrop jutting into the sea opposite the centre of Tropea. This was once an island and the attractive monastery on the summit, Santa Maria dell'Isola, sits in gardens above the sea (closed for restoration at the time of writing). Tropea may be a simple small town dominated by tourism nowadays, but it has enjoyed significant prosperity throughout the centuries, evidenced by the many churches, grand palaces and majestic portals throughout the town centre. Tropea's Norman cathedral, the Duomo, is one of the most interesting buildings in town (though unfortunately closed during our visit). The patron saint of the town is the Madonna of Romania - celebrated as the town's protectress through earthquakes and wars. An icon bearing an image of this venerated Madonna is carried through town in a procession during religious festivals. 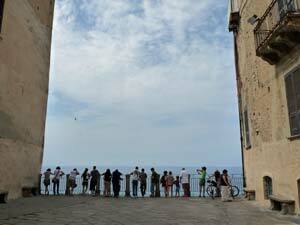 Tropea has a little museum, the Museo Diocesano, in the Bishop's Palace, the Palazzo Vescovile, by the Duomo. It contains mostly religous art including painted wooden statues and silver reliquaries (open April - October; hours are limited). 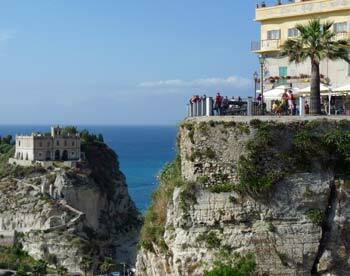 It is Tropea's position high on the cliffs which makes the town so dramatic. It does come with an obvious drawback, though: to walk from the town centre to the sea involves descending flights of steps or a zig-zag road. There are beaches on either side of the town where you can choose from fee-charging beach establishments with sunbeds and parasols, or stretches of free beach where you can spread your own towel. The water is invitingly clear, though the beach does shelve quite steeply into the water. There are plenty of other beaches along the coast and for a slightly different beach experience you can walk along past the town's smart marina to another beach just beyond. 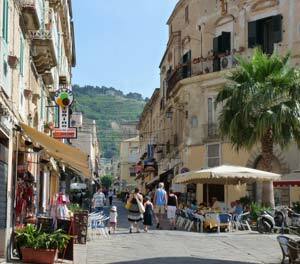 Tropea is full of small and affordable restaurants serving pizza and traditional local meals. You will find similar menus throughout town, generally offering the chance to try local seafood and the town's big speciality: sweet red onions. Other local treats to try include of course ice cream - for wild and bizarre flavours, visit Tonino's on the main street - and latte di mandorla, almond milk, a refreshing and cooling drink. Tropea has its share of typical tourist shops selling beach goods and souvenirs. One souvenir shop that is definitely worth a visit is Il Faro Presepi on Via Stazione, which sells nativity scenes and features a display of little moving models illustrating traditional Calabrian lifestyles: good fun and interesting too (you can see some on their website, listed above right). 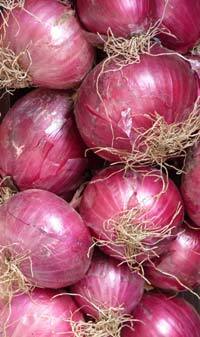 As previously noted, in this country where food is all-important, Tropea is very famous for its red onions. You can buy strings of onions along with other local foods and wines in many places in town. Those who like pepper and hot, spicy food will appreciate the region's fiery products. The nearest airport to Tropea is at Lamezia Terme. From the airport, catch a bus or take a taxi to Lamezia Terme station. The train journey to Tropea takes an hour and costs just over €3. In August you may be lucky and find a free bus service operating from the airport which stops in the villages along the Costa degli Dei, including Tropea - check the airport website for the latest news. Tropea is on a scenic little railway line which branches off from the main Naples - Reggio di Calabria route at Lamezia Terme and follows the bulge of coast around Capo Vaticano before meeting up with the mainline again at Rosarno. Tropea railway station is a short walk uphill from the centre of town. There is a ticket machine at the station which sells tickets for local journeys, and there are timetables on the platform. To buy train tickets in advance, or for longer journeys, visit the Agenzia Viaggi MA&MA travel agency on Via Regina Margherita (closed lunchtimes). To reach the centre of Tropea from the railway station, follow the access road to the left outside the station building. Where this joins a larger road, turn left and follow it under a railway bridge. This road continues downhill right into the heart of Tropea. The walk to the old town takes around fifteen minutes. Although the towns in this area are connected by occasional bus services, these operate mainly for the benefit of workers and schoolchildren. It is hard to obtain information and timetables are not usually convenient for tourists. The tourist information office has limited information available. Along the Calabrian coast, and easily reachable by the local trains, are several other appealing resorts. Scilla, to the south, is an extremely picturesque fishing town with an impressive castle on a headland. Pizzo, to the north, is a cheerful seaside town famous for its chocolate truffle ice cream. Reggio Calabria is further away, but it is worth the train journey to see the two famous Greek statues - the Riace Bronzes - displayed in the town's excellent archaeological museum, and to admire the views over the Straits of Messina to Sicily. One of the highlights of a stay in Tropea is a boat trip to the Aeolian Islands; either a daytime trip to visit two or three of the islands, or an afternoon - evening excursion to view the eruptions of Stromboli, an active volcano. 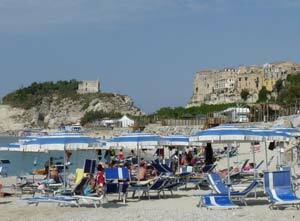 Several different companies in Tropea organise day trips, and you'll find advertising leaflets and agencies selling tickets throughout Tropea. Bear in mind that this is a long day out and could be cancelled at short notice if the sea conditions aren't favourable. The Aeolian Islands are a great destination in their own right, and if you have time for a longer visit, you could make it a two-centre holiday in combination with Tropea. On clear days, Stromboli is visible from Tropea. 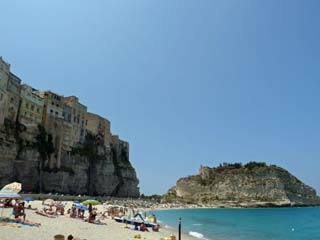 If you have a hire car, you will be able to explore the other attractive beaches and viewpoints around Tropea, and perhaps tour several villages or towns in a day. The Costa degli Dei offers a succession of little seaside settlements such as Ricadi, Parghelia and Briatico as well as the viewpoint and lighthouse of Capo Vaticano. Zungri, a short way inland, has some abandoned cave-dwellings to visit. If you don't want to drive, but find the public transport options limiting, it may be worth hiring a car with a driver to take a tour - we organised a good-value tour through our hotel. Finally, there are various organised excursions from Tropea for those who'd prefer not to travel independently. The tourist information offices or travel company agencies can supply up-to-date details of these. Although this area is popular as a holiday destination, there are surprisingly few hotels in Tropea itself. We stayed in the conveniently-central Villa Antica Tropea.